From Siri to Google Translate, deep neural networks have enabled breakthroughs in machine understanding of natural language. Most of these models treat language as a flat sequence of words or characters, and use a kind of model called a recurrent neural network (RNN) to process this sequence. But many linguists think that language is best understood as a hierarchical tree of phrases, so a significant amount of research has gone into deep learning models known as recursive neural networks that take this structure into account. While these models are notoriously hard to implement and inefficient to run, a brand new deep learning framework called PyTorch makes these and other complex natural language processing models a lot easier. While recursive neural networks are a good demonstration of PyTorch’s flexibility, it is also a fully-featured framework for all kinds of deep learning with particularly strong support for computer vision. The work of developers at Facebook AI Research and several other labs, the framework combines the efficient and flexible GPU-accelerated backend libraries from Torch7 with an intuitive Python frontend that focuses on rapid prototyping, readable code, and support for the widest possible variety of deep learning models. This post walks through the PyTorch implementation of a recursive neural network with a recurrent tracker and TreeLSTM nodes, also known as SPINN—an example of a deep learning model from natural language processing that is difficult to build in many popular frameworks. The implementation I describe is also partially batched, so it’s able to take advantage of GPU acceleration to run significantly faster than versions that don’t use batching. 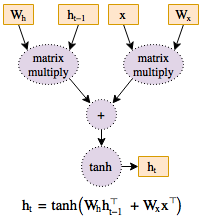 This model, which stands for Stack-augmented Parser-Interpreter Neural Network, was introduced in Bowman et al. (2016) as a way of tackling the task of natural language inference using Stanford’s SNLI dataset. In particular, the goal of the research that led to SPINN was to do this by encoding each sentence into a fixed-length vector representation before determining their relationship (there are other ways, such as attentional models that compare individual parts of each sentence with each other using a kind of soft focus). WORDS:  The church   has cracks in the ceiling         . Place the words into the buffer. Pop “The” from the front of the buffer and push it onto stack, followed by “church”. Pop top two stack values, apply Reduce, then push the result back to the stack. Pop “has” from buffer and push to stack, then “cracks”, then “in”, then “the”, then “ceiling”. Repeat four times: pop top two stack values, apply Reduce, then push the result. Pop “.” from buffer and push onto stack. Repeat two times: pop top two stack values, apply Reduce, then push the result. Pop the remaining stack value and return it as the sentence encoding. You could easily imagine writing code to do these things in your favorite programming language. For each sentence to be processed it would load the next word from the buffer, run the Tracker, check whether to push onto the stack or perform a Reduce, do that operation, then repeat until the sentence is complete. Applied to a single sentence, this process constitutes a large and complex deep neural network with two trainable layers applied over and over in ways determined by the stack manipulation. But if you’re familiar with traditional deep learning frameworks like TensorFlow or Theano, it’s difficult to implement a dynamic procedure like this. It’s worth stepping back and spending a little while exploring why that’s the case, and what PyTorch does differently. Figure 1: Graph structure representation of a function. Deep neural networks are, in essence, just complicated functions with a large number of parameters. The goal of deep learning is to optimize these parameters by computing their partial derivatives (gradients) with respect to a loss metric. If the function is represented as a graph structure of computations (Figure 1), then traversing this graph backwards enables computing these gradients without any redundant work. Every modern framework for deep learning is based on this concept of backpropagation, and as a result every framework needs a way to represent computation graphs. 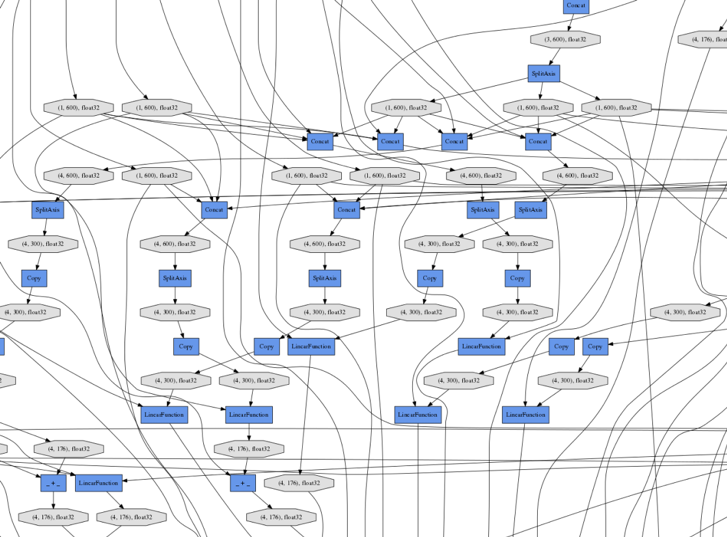 In many popular frameworks, including TensorFlow, Theano, and Keras, as well as Torch7’s nngraph library, the computation graph is a static object that is built ahead of time. The graph is defined using code that looks like mathematical expressions, but whose variables are actually placeholders that don’t yet hold any numerical values. This graph of placeholder variables is compiled once into a function that can then be run repeatedly on batches of training data to produce outputs and gradients. This kind of static computation graph approach works well for convolutional networks, whose structure is typically fixed. But in many other applications, it would be useful if the graph structure of neural networks could vary depending on the data. In natural language processing, researchers usually want to unroll recurrent neural networks over as many timesteps as there are words in the input. The stack manipulation in the SPINN model described above relies heavily on control flow like for and if statements to define the graph structure of computation for a particular sentence. In even more complex cases, you might want to build models whose structure depends on the output of subnetworks within the model itself. Some (though not all) of these ideas can be shoehorned into static-graph systems, but almost always at the cost of reduced transparency and confusing code. The framework has to add special nodes to its computation graphs that represent programming primitives like loops and conditionals, while users have to learn and use these nodes rather than the for and if statements in the language they’re writing their code in. This is because any control flow statements the programmer uses will run only once, when the graph is built, hard coding a single computation path. For example, running a recurrent neural network unit (rnn_unit) over the vectors in words (starting with initial state h0) requires tf.while_loop, a special control flow node, in TensorFlow. An additional special node is needed to obtain the length of words at run time, since it’s only a placeholder at the time the code is run. A fundamentally different approach, pioneered in decades of academic work including Harvard’s Kayak and autograd, as well as the research-centric frameworks Chainer and DyNet, is based on dynamic computation graphs. In such a framework, also known as define-by-run, the computation graph is built and rebuilt at runtime, with the same code that performs the computations for the forward pass also creating the data structure needed for backpropagation. This approach produces more straightforward code, because control flow can be written using standard for and if. It also makes debugging easier, because a run-time breakpoint or stack trace takes you to the code you actually wrote and not a compiled function in an execution engine. The same variable-length recurrent neural network can be implemented with a simple Python for loop in a dynamic framework. PyTorch is the first define-by-run deep learning framework that matches the capabilities and performance of static graph frameworks like TensorFlow, making it a good fit for everything from standard convolutional networks to the wildest reinforcement learning ideas. So let’s jump in and start looking at the SPINN implementation. Before I start building the network, I need to set up a data loader. It’s common in deep learning for models to operate on batches of data examples, to speed up training through parallelism and to have a smoother gradient at each step. I’d like to be able to do that here (I’ll explain later how the stack-manipulation process described above can be batched). The following Python code loads some data using a system built into the PyTorch text library that automatically produces batches by joining together examples of similar length. After running this code, train_iter, dev_iter, and test_iter contain iterators that cycle through batches in the train, validation, and test splits of SNLI. You can find the rest of the code for setting up things like the training loop and accuracy metrics in train.py. Let’s move on to the model. As described above, a SPINN encoder contains a parameterized Reduce layer and an optional recurrent Tracker to keep track of sentence context by updating a hidden state every time the network reads a word or applies Reduce; the following code says that creating a SPINN just means creating these two submodules (we’ll see their code soon) and putting them in a container to be used later. SPINN.__init__ is called once, when the model is created; it allocates and initializes parameters but doesn’t perform any neural network operations or build any kind of computation graph. The code that runs on each new batch of data is defined in the SPINN.forward method, the standard PyTorch name for the user-implemented method that defines a model’s forward pass. It’s effectively just an implementation of the stack-manipulation algorithm described above, in ordinary Python, operating on a batch of buffers and stacks—one of each for every example. I iterate over the set of “shift” and “reduce” operations contained in transitions, running the Tracker if it exists and going through each example in the batch to apply the “shift” operation if requested or add it to a list of examples that need the “reduce” operation. Then I run the Reduce layer on all the examples in that list and push the results back to their respective stacks. # list; they have also been prefixed with a null value. A call to self.tracker or self.reduce runs the forward method of the Tracker or Reduce submodule, respectively, which takes a list of examples on which to apply the operation. It makes sense to operate independently on the various examples here in the main forward method, keeping separate buffers and stacks for each of the examples in the batch, since all of the math-heavy, GPU-accelerated operations that benefit from batched execution take place in Tracker and Reduce. In order to write those functions more cleanly, I’ll use some helpers (which I’ll define later) which turn these lists of examples into batched tensors and vice versa. I’d like the Reduce module to automatically batch its arguments to accelerate computation, then unbatch them so they can be independently pushed and popped later. The actual composition function used to combine the representations of each pair of left and right sub-phrases into the representation of the parent phrase is a TreeLSTM, a variation of the common recurrent neural network unit called an LSTM. This composition function requires that the state of each of the children actually consist of two tensors, a hidden state h and a memory cell state c, while the function is defined using two linear layers (nn.Linear) operating on the children’s hidden states and a nonlinear combination function tree_lstm that combines the result of the linear layers with the children’s memory cell states. In the SPINN, this is extended by adding a third linear layer that operates on the Tracker’s hidden state. Figure 2: A TreeLSTM composition function augmented with a third input (x, in this case the Tracker state). 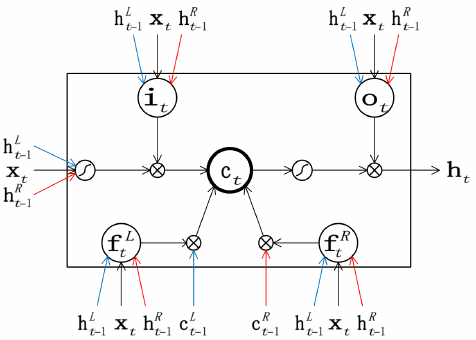 In the PyTorch implementation shown below, the five groups of three linear transformations (represented by triplets of blue, black, and red arrows) have been combined into three nn.Linear modules, while the tree_lstm function performs all computations located inside the box. Figure from Chen et al. (2016). # candidate output a and four gates (i, f1, f2, and o). Since both the Reduce layer and the similarly implemented Tracker work using LSTMs, the batch and unbatch helper functions operate on pairs of hidden and memory states (h, c). And that’s all there is to it. (The rest of the necessary code, including the Tracker, is in spinn.py, while the classifier layers that compute an SNLI category from two sentence encodings and compare this result with a target giving a final loss variable are in model.py). The forward code for SPINN and its submodules produces an extraordinarily complex computation graph (Figure 3) culminating in loss, whose details are completely different for every batch in the dataset, but which can be automatically backpropagated each time with very little overhead simply by calling loss.backward(), a function built into PyTorch that performs backpropagation from any point in a graph. The models and hyperparameters in the full code can match the performance reported in the original SPINN paper, but are several times faster to train on a GPU because the implementation takes full advantage of batch processing and the efficiency of PyTorch. While the original implementation takes 21 minutes to compile the computation graph (meaning that the debugging cycle during implementation is at least that long), then about five days to train, the version described here has no compilation step and takes about 13 hours to train on a Tesla K40 GPU, or about 9 hours on a Quadro GP100. Figure 3: A small section of the computation graph for a SPINN with batch size two, running a Chainer version of the code presented in this post. The version of the model described above without a Tracker is actually fairly well suited to TensorFlow’s new tf.fold domain-specific language for special cases of dynamic graphs, but the version with a Tracker would be much more difficult to implement. This is because adding a Tracker means switching from the recursive approach to the stack-based method. This (as in the code above) is most straightforwardly implemented using conditional branches that depend on the values of the input. But Fold lacks a built-in conditional branching operation, so the graph structure in a model built with it can depend only on the structure of the input and not its values. In addition, it would be effectively impossible to build a version of the SPINN whose Tracker decides how to parse the input sentence as it reads it since the graph structures in Fold—while they depend on the structure of an input example—must be completely fixed once an input example is loaded. One such model was explored by researchers at DeepMind and Google Brain, who applied reinforcement learning to train a SPINN’s Tracker to parse input sentences without using any external parsing data. Essentially, such a model starts with random guessing and learns by rewarding itself when its parses happen to produce good accuracy on the overall classification task. The researchers wrote that they “use batch size 1 since the computation graph needs to be reconstructed for every example at every iteration depending on the samples from the policy network [Tracker]”—but PyTorch would enable them to use batched training even on a network like this one with complex, stochastically varying structure. PyTorch is also the first framework to have reinforcement learning (RL) built into the library in the form of stochastic computation graphs, making policy gradient RL as easy to use as backpropagation. To add it to the model described above, you would simply need to rewrite the first few lines of the main SPINN for loop as follows, allowing the Tracker to define the probability of making each kind of parser transition. The Google researchers reported results from SPINN plus RL that were a little bit better than what the original SPINN obtained on SNLI—despite the RL version using no precomputed parse tree information. The field of deep reinforcement learning for natural language processing is brand new, and research problems in the area are wide open; by building RL into the framework, PyTorch dramatically lowers the barrier to entry. Come to the GPU Technology Conference, May 8-11 in San Jose, California, to learn more about deep learning and PyTorch. GTC is the largest and most important event of the year for AI and GPU developers. Use code CMDLIPF to receive 20% off registration! Join me at GTC and hear more about my work in my talk with Stephen Merity, Quasi-Recurrent Neural Networks – A Hightly Optimized RNN Architecture for the GPU (S7265). You’ll also enjoy Soumith Chintala’s talk, PyTorch, a Framework for New-Generation AI Research. Follow the instructions at pytorch.org to install on your chosen platform (Windows support is coming soon). PyTorch supports Python 2 and 3 and computation on either CPUs or NVIDIA GPUs using CUDA 7.5 or 8.0 and CUDNN 5.1 or 6.0. The Linux binaries for conda and pip even include CUDA itself, so you don’t need to set it up on your own. The official tutorials include a 60-minute introduction and a walkthrough of Deep Q-Learning, a modern reinforcement learning model. There’s also a wonderfully comprehensive tutorial from Stanford’s Justin Johnson, while the official examples include—among other things—a deep convolutional generative adversarial network (DCGAN) and models for ImageNet and neural machine translation. Richie Ng from National University of Singapore keeps an up-to-date list of other PyTorch implementations, examples, and tutorials. The PyTorch developers and user community answer questions at all hours on the discussion forum, though you should probably check the API documentation first. Even though PyTorch has only been available for a short time, three research papers have already used it several academic and industry labs have adopted it. Back when dynamic computation graphs were more obscure, my colleagues and I at Salesforce Research used to consider Chainer our secret sauce; now, we’re happy that PyTorch is bringing this level of power and flexibility into the mainstream, with the support of major companies. Happy hacking! 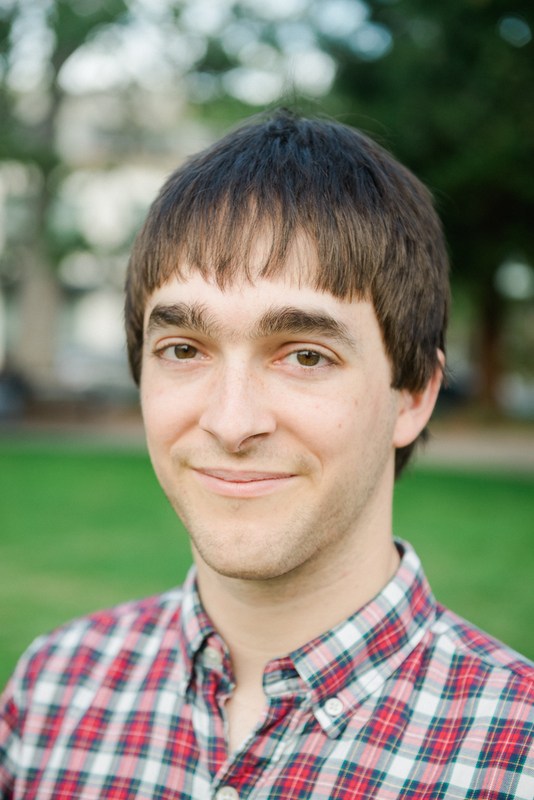 James Bradbury is a research scientist at Salesforce Research, where he works on cutting-edge deep learning models for natural language processing. James joined Salesforce with the April 2016 acquisition of deep learning startup MetaMind Inc., and he is an active contributor to the Chainer and PyTorch deep learning software frameworks. James holds a degree in linguistics from Stanford University.